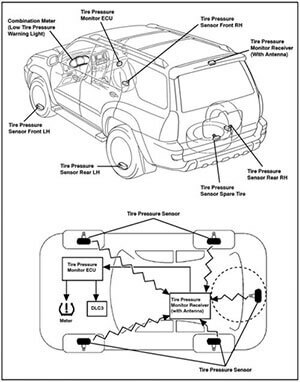 Tire Inflation Pressure Monitor Systems (TPMS) are being used on more and more new vehicles. Low inflation on tires is potentially dangerous, especially if a vehicle is heavily loaded and traveling at highway speeds during hot weather. A low tire under these conditions is a blowout waiting to happen. 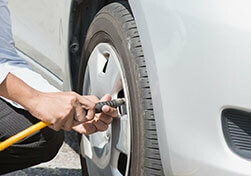 The inflation pressure of the tires should be checked regularly, but many motorists do not check their tires. That is why Tire Pressure Monitor Systems are coming into use. Tires are designed to operate within a certain pressure range. The recommended inflation pressure can usually be found in the vehicle owner’s manual, or on a decal that may be located in the glove box or door jam. The recommended inflation pressure is designed to give the best combination of ride comfort, load carrying capacity and rolling resistance. Increasing the tire inflation pressure reduces rolling resistance (which helps fuel economy). It also increases the load carrying capacity of the tire. But it also increases ride harshness. The maximum inflation pressure (which can be found on the sidewall of the tire) should never be exceeded because too much pressure may overstress the tire and increase the risk of tire failure.